Edible gardeners want to eat what they grow. Chicken owners want happy egg-laying helpers. But happy, free-ranging chickens will mess up a veggie patch faster than you can say cotyledon. And that is the conflict garden-growing chicken-owners face. Jessi sent me a review copy of the book so I would have a chance to read it before her virtual release party, happening today all over the interwebs*, and I’m so glad she did. How to turn chickens into a moderately effective weed-controlling yard-crew with paddock-style fencing. How to use groundcover to discourage chickens from going places you don’t want. How terrifically hip and modern expanded metal mesh looks on a chicken coop. The book provides a good overview on coop building styles and considerations, very basic chicken care info, do-grow/don’t-grow plant lists for the chicken garden and lots and lots of gorgeous inspirational pictures. But for me, the most valuable thing Free-Range Chicken Gardens offers is insightful evaluation on how to design the coop, run and fencing so that it’s easier to make the chickens an active ally in the garden. I wish Jessi had published this book last year, before we built our chicken coop. I would have done things a little differently in terms of incorporating paddock fencing into the design. As it is, I think the advice in this book will really help us put the chickens to their all-around best use while keeping them happier and healthier in the process. It’ll just be a little more tricky to take full advantage of the wisdom now than it would have been a year ago. People still thinking about getting chickens or upgrading your current coop, I highly recommend this book before you start to build. It’s got great ideas to ponder. 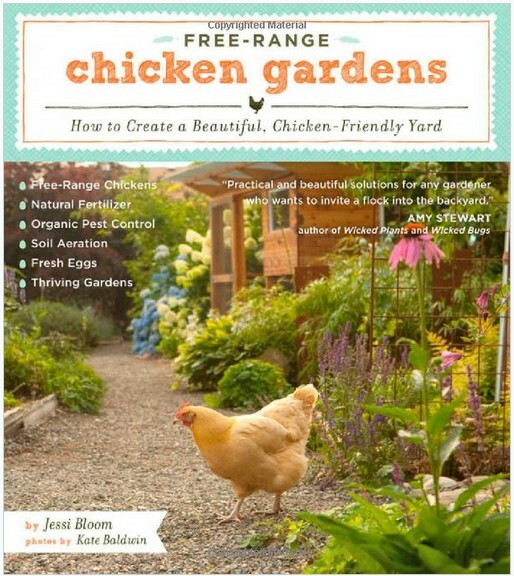 Current flock owners, if you are struggling with how to get your chickens to eat the weeds and not the arugula, then this is the book for you, too. Timber Press, the excellent publishing house for Free-Range Chicken Gardens, has apparently lost their mind and they are giving away free books all over the damn place. 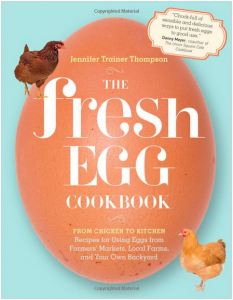 They are giving away a copy of both Free-Range Chicken Gardens and The Fresh Egg Cookbook, which should inspire you with new ideas for what to do with all those backyard eggs. To enter to win both books, leave a comment with either your most pressing chicken question (I’ll see if I can find a chicken expert to answer it for you), your funniest chicken story (make us laugh! ), the number one reason other than eggs you want chickens (homemade feather bed? ), or your favorite egg recipe (title/description is fine, you don’t need to type up the whole recipe). Feel free to comment as much as you’d like, but only one entry per person will be counted and one winner will be chosen. Entries will be accepted until Wednesday April 11, 8 PM PST. Winner will be announced on Thursday April 12th. Timber Press isn’t just giving these books away on this blog, they’re also sponsoring a half-dozen identical giveaways around the virtual world. Which means…enter here and then start clicking around, because even if you don’t win the NW Edible giveaway, you might win one of the other ones. Other bloggers will probably have different ways of entering, since we’re all doing this separately, so be sure to check what the other sites are looking for before going all cut-and-paste on this giveaway. Also, if you haven’t yet entered yesterday’s giveaway (we’re giving away stuff right-and-left this week! ), make sure to put your name in the hat to win a year’s subscription to Urban Farms Magazine by taking the Seed Starting Challenge (it’s easy!). Bloggers, you can also link-up your favorite post on edible gardening or seed starting and be entered to win a (second, Northwest Edible-sponsored) subscription to Urban Farms Magazine too, if readers pick your post as their favorite! My FAVORITE recipe is one I make every Sunday for my family: pfaankuchens (German Puff Pancakes). I use my grandmother’s recipe (http://bigmamamorgan.blogspot.com/2010/05/gramma-barruss-fankuuchens.html) and it’s a fantastic way to use up eggs! Just curious … For a book giveaway like this, do the publishers get our email addresses? I LOVE all my 16 chickens, my kids and I can’t stop picking out new baby chicks every time we go to FHA. We started with 4, and now they have taken over the yard! We have a summer and winter home (the green house) for them and the only place they are not allowed is the deck (I have to have a poop free zone). I would LOVE, LOVE, LOVE my yard to beautiful and chicken friendly. A CHICKEN WONDERLAND of Happiness. Wow, it’s hard to settle on my one main reason for wanting chickens (besides the eggs). I love using them as a chook-tractor (though they’ve entirely de-greened their main run, so I probably need this book to figure out how to get them to spread the love around, aside from moving them to the chook dome from time to time), they make great fertiliser, a love love love that I can give them my scraps and feel like I get something right back (eggs and fertiliser), although we do already have that from the compost. I grew up with chickens and when I was little I used to think I had a special touch in getting them to come to me by clucking and tucking my arms under to be “like them.” Haha! Thinking about that now, I probably just looked like an odd little girl! I’ve been dreaming of having my own chickens since then though! Question: I’m trying to decide between rabbits or chickens. What would be the advantage of chickens over rabbits? My favorite egg dish: I have so many, but one I’ve been making is very simple–boiled german butterball potatoes with lots of butter and some sesame oil a la Carol Deppe, fried eggs, and homemade kim chi. Yum. When my daughter, E, was a year old, she and I lived with my parents and their flock of free ranging Rhode Island Reds (10 hens and a rooster). The flock was never far away when we played outside. The hens often wandered in the garden under E’s open bedroom window while she was (supposedly) napping. When asked, “What does a chicken say?” or “What does a rooster say?” E could nail the sound of a hen “ba-gawking” or a rooster crowing. She picked up dozens of nuanced sounds that the birds made all day long. 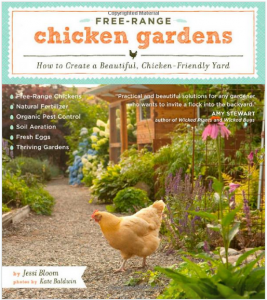 I’m so excited, I would love to win the Free Range Chicken Garden book! I want chickens because I want to listen to them clucking about in the garden! I WANT CHICKENS IN MY BACK YARD!!! I just came in from cutting down weed trees and years old grapevines to find a tick crawling on my shoe…chickens would have eliminated that little crawler AND provided lovely eggs in return. Advanced Chicken Travel…(apologies for the length) Six years ago I got my first flock. My ex-significant other, M, and I modified a former coop on the property we rented, readying it for six birds. M did trail restoration work in the wilds of central Idaho, and stopped by one of the few private in-holdings. The in-holdings, commonly called “ranches” although most don’t have cows anymore, are a mix of privately owned properties or commercial guest ranches catering to fisherman and hunters. The caretaker of this private property said she needed to get rid of one rooster who was bullied, and a few hens. M fashioned cardboard boxes to accommodate one bird each, stacked three high, and tied the load to his back. In the span of a day, the chickens were hiked three miles to the river, boated 40 minutes on a jet boat out of the woods, driven one hour on a dirt road, three hours on a highway to our house, and finally introduced to their new home. They took to the new location immediately, and a friend gave us three more barred rock hens. The rooster, a solid white gent, took great care of them as they roamed around the expansive property. I taught our Aussie shepherd/ blue heeler to herd them, giving the commands “chickens out” for pushing the chickens out of the garden or flower beds, and “round them up” to gather the birds together when they strayed too far. The pair of resident geese adopted them, and were often seen amidst the flock. The dog typically sat at a distance on the lawn with one eye on her birds. The dog never attempted to harm them or play with them. Immediately, she seemed to understand her role and relished the opportunity to be of help. Fast forward two years….the woman who was caretaking the private, back-country ranch and who gave us the initial three birds contacted us. Would M and I be interested in her job? Within months we wrapped up our town life, sold most of our possessions, got a storage unit for what remained, and moved in. Moving consisted of packing our possessions into fruit boxes, to be loaded on horseback to the ranch after a boat ride and long drive. This included the prodigal chickens, with much clucking, squawking, and creative packing. Our chickens had a small flock to merge with at the ranch, and the dog resumed her work. The ranch was significantly more remote than our former farmhouse, with many more predators. The dog did her job beautifully, sitting with the flock or mingling with them every single day. A ranch cat took a liking to the dog (the cat who wanted to be a dog), and soon the both of them were the chicken security team. The whole crew wandered all over the place, every day and in all kinds of weather. We never lost any birds to predators. The following summer, the flock grew to 35 with a surprising addition of 15 chicks hatched in late October. Circumstances have changed, and that is no longer my life. I don’t have chickens in my current home, but it is temporary and I look forward to the day when I can have them again. I don’t have my beloved dog either, but I do have a stash of wonderful pictures and a lot of good memories. My all-time favorite egg recipe is deviled eggs, made with a splash of vinegar and lots of paprika! the number one reason we want chickens – the kiddos visit the neighbor’s chickens regularly and want some of their very own. they’ve already picked out where the bird yard will be, and they’re deciding what kinds of birds they want. Besides the eggs, I want to add chickens for some fun and excitement out in the garden! I was so proud of myself this year when I started some spring seeds in January. I had row covers on and everything was going well…. until…. One of the hens found her way into the row cover and devoured all my starts and even dug up and ate the celery roots that i had over wintered and were starting to grow. We almost had chicken soup that night… The Chicken Garden is something that I need to read since I would still love to let my hens in the garden no mater the season. I have a picture of one chicken sitting on her sister trying to get her to hurry so she could lay her egg. I took this picture while I was changing the coop over from straw to sand. I love it. It is so much easier the chicken love it also. I have one more story. This take place between my 5 year old great niece and my mother, her Great Grandmother. Grandma, let go see if the chickens pooped and egg? They don’t poop the eggs they lay the egg. Emily, with a you think I’m a fool, look on her face. Mine is one of the few local municipalities (all urban) that DO NOT allow backyard chickens. Apparently a local resident has tried four times in the past 8 years or so to get the city to approve them. But with mostly the same people on council all this time, the answer is still NO. Beats me why this should be when a couple miles to the east of me the next municipality is fine with them. In the meantime (they have to fold sometime…) I’m studying up on chicken care. So it is ok to have pet birds, snakes, hamsters, cats, dogs…..as long as they are inside pets? So a chicken could just be a really big parrot. Hmmm, my pressing chicken question of the day is “Why are they pulling out each others tail feathers?”. Most of my hens have bare butts! This book sounds right up my alley! I may need to get it, whether or not I manage to win a copy. Our chickens wreck the garden when they get out. As a naturally talented artist and organic gardener I would LOVE to raise and plan to raise chickens for a number of the obvious reasons (benefits in the garden and eggs) and for the not so obvious. I would like to incorporate wall art using the naturally colorful eggshells into a cob house that I plan to build. I also like to use the molted feathers for jewelry, headbands, and for ornament on handmade leather clothing. I have 3 chicks (my first) I could use all the help I can get.I started eating free range eggs 2 years ago and can’t go back so I though I would do my own. I have a 2 ac. organic garden and 6 grandbabies to help.I’m hope to teach them good eating habits.These books would help me do it right the first time! If I win I will let you know how it is going! I would lVOE to win these books. I am a new chicken owner and still raising the funny girls in the brooder in the basement. Chicken Question: One of the 2 Barred Rocks that I purchased has begun to look drastically different than the other one-such as not as defined barring on the feathers,develping faster, larger comb, and darker coloring on the fronts of legs. Is there any way to tell if this one is a rooster besides just waiting for it to start crowing?? The irony in all of this is that my son picked this “hen” as his and named “her” Curious GEORGE……I really hope George is a GIRL!!! I have finally worn my husband down and he has agreed to help me build a coop. We were thinking of using the back of our garage (and letting the girls enter and exit the coop from a window with a ramp). Is there any reason why we shouldn’t do this? It seems like more people would use their garage. I thought it would much more secure from predators and warmer (we are in NY) and I could collect eggs from going in the garage and not outside. We were thinking of building a chicken run for them when they exit the coop door so they could still have some exercise if we were away for the day. I looked around at chicken related sites and found a few pics and ideas. My question is: Can I have chickens in with my goats? As long as your goat is not too agressive with the chickens, it will be fine. Our neighbors used to have their goats, chickens, pigs and dogs all running around the yard. They all got along fine. However just like with humans….sometimes you run into a cranky animals that needs to be separated from the others. All winter I kept my polish hens in a separate coop, to avoid the other chickens picking on them. They didn’t have any access to the outside, but the coop was very, very large. I’d have to collect eggs from them everyday. Now that it’s warmer out, I moved them to a tractor (more than big enough so space isn’t the problem) and I’m not getting any eggs. It’s been about a month now and nothing, and I’m pretty sure they’re eating them. Any ideas why? They have tall grass and feed offered….I’d love to win! Would love to win these books. Our biggest problem right now which we have never had a problem with before is chickens picking on each other so therefore we have to keep some of them separate. Chickens are wonderful companions! I would want a few to live in my garden and help provide chicken manure and control the pest population. Comments are now closed! Thanks for entering – the winner will be announced tomorrow.